The dilemma: you just found a mother cat and her kittens and you can’t keep them. As much as you’d like to, for one reason or another, it’s out of the question. You bring the little family inside because they’re in an unsafe place. 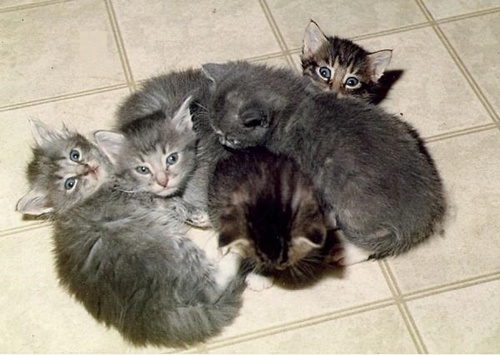 Many nursing mother cats are hit and killed by cars or attacked by wild animals. Young kittens are fragile, regardless. You’ve seen pleas for help on social media. The problem is this year has been a nightmare of a kitten season. Rescues are full, fosters are full and humane societies have a waiting list a mile long. Your local shelter is a kill shelter and advertising on Craigslist can prove deadly (see Michaels article here). No one can help (and it’s not because they don’t want to). What can be done at this point? Cat advocates: HELP! There are many out there in this situation and need your input! 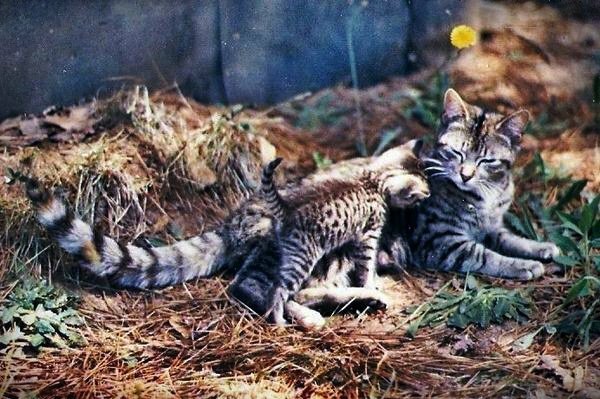 Note: Photos of mother cat and kittens were taken in the mid-1980’s and have been used in multiple articles. This entry was posted in cat rescuer and tagged cat fosterering, stray cats, The Articles of Elisa Black-Taylor by Elisa Black-Taylor. Bookmark the permalink. I’ve been in the position where a landloord was a compassionless git and I signed the lease, so I have been on a blinder to nothing trying to persuade him to allow me to keep a mummy cat & 3 kittens. Eventually, I ended up paying for a pen at a cattery. Going there before and after work (often lunchtimes too) to care for the little family. I did this to cut the cost of renting the space from the cattery. That took some negotiating with the cattery owner I can tell you. After two months, the husband of the owner, a very kind bloke, must have had a word with his wife, they cut the fee to £10pw, I still provided all food, litter & care, got mummy cat spayed when she was built up a bit, vaccinations too. It was 5 months before mummycat and all three now adolescent kittens were rehomed. The cattery owner’s husband adopted the mummycat. Just before he left his wife and the cattery. I got a Christmas card and photo from Mummycat for 17 years. She would have been about 18 when she died in her sleep on her human’s bed. She was very loved. Her kittens went to friends who gradually moved into their own places, one kitten was rehomed again to a friend’s cat loving Mum, when my friend had a very bad car smash. This was a hard 5 months and absolutely no one else would help. Everywhere was full to breaking point. Even the vets I used then, could not provide shelter full time, they always gave me good discounts on rescue cat work, often not charging for somethings, like a short course of antibiotics or pain relief. I was very grateful for that. Home made tray bakes of brownies etc delivered at every vet visit helped there, big time. I’d say being brave, creative, pushing way out side of your comfort zone gives you the best chance of helping the cats. Be prepared to travel daily, do the maintenance work, beg friends, family for food, litter, just never let it enter your head that it will not work. Get all friends, family, colleagues to spread the rescue story and the need for homes. It might take more time than you figured. I would not have been able to help this little family if I had not been working a full time job. I pinned up pictures of the cat family at work in my shared office and the classrooms, putting up new ones every week. At least once a week I would find a bag of litt er on my desk or some cat food placed in my desk drawers. I could guess who were the donors, but two of them were not cat lovers, the pictures (+ progress reports) really helped. This took place in the mid ’80s. Since 1989 I have usually had the space and authority to provide immediate shelter. I did have to hide the cat family in my flat for a few days, unknown to the landlord. I would not recommend deceit, as it puts the cats and the rescuer at risk of being made homeless.